Alcad starts with the commercialization of the first multiband amplifier of its Everest range. As world leaders in amplification, once again Alcad Electronics conquers the market offering a robust, versatile and easy to install product. The wide Everest range consists in multiband amplifiers with an output signal level of 117 dBμV and manufactured 100% in Irún (Gipuzkoa). 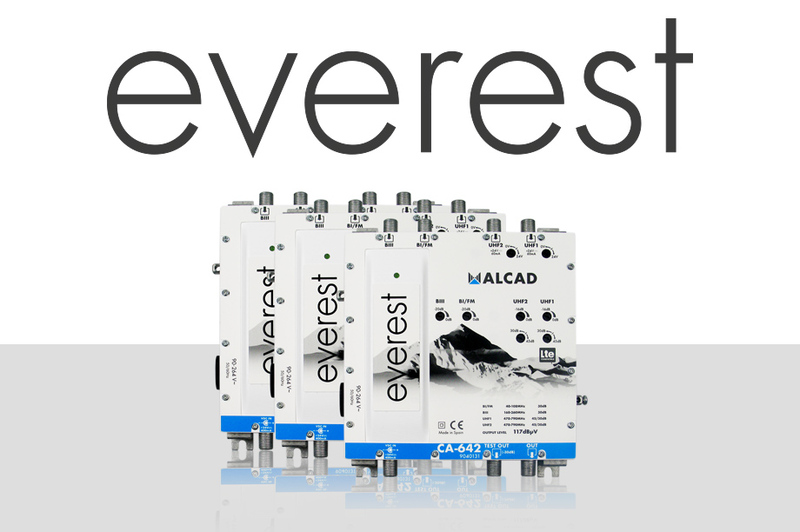 In addition to the experience and quality inherent in its products, the Alcad Electronics team has focused on creating a competitive product thought considering the installer needs; in order to make things easier, the Everest multiband amplifiers do not require a programmer or special tools, making the installation and commissioning extremely quick and simple. Moreover, due to its tiny footprint (15.6x13.9x3.6 cm), it fits anywhere. The range is wide and counts on models with 3, 4 and 5 inputs with up to 3 UHF inputs with switchable gain, including filters for LTE700 and LTE800. All these features packed in a 100% metallic chassis prepared for harsh environment. The EVEREST range offers reliability and versatility too. They have an integrated power supply and provides the option to install a second redundant external power supply. Therefore the failure risk is reduced to cero even when strong storms show up. The whole range counts on Made in Spain guarantee and CE certificate under directive RED 2014/53/UE.